Meet at Sandakan Airport upon arrival from Kota Kinabalu . Transfer to jetty for 1 hour boat ride to Selingan Island. Check in at Chalet and lunch at Selingan cafeteria. Free and leisure. Pamper yourself with a good tan, swim, snorkel or explore the island. 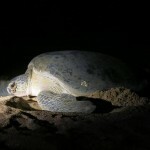 In the evening, 2 species of marine turtles – the green and hawksbill come ashore here to lay their eggs. 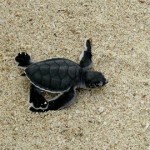 After dinner, witness the laying of eggs and the release of little baby turtles into the sea. Overnight at chalet. 0700 am Return to Sandakan by boat ride and proceed to Sepilok Rehabilitation Centre. Orphaned and injured Orang Utan is brought to Sepilok for rehabilitation before returning them to their natural habitat. Sepilok is a primary lowland forest, a fine showcase one of Borneo’s remaining rain forest. Witness the feeding time from a platform in the forest. After feeding time, depart Sepilok for lunch at local restaurant. After lunch, transfer to Sandakan Airport for flight departure back to Kota Kinabalu.